Hosemann presented the sample ballot to Bryant at a meeting of the state Board of Election Commissioners, comprised of Bryant, Hosemann and Attorney General Jim Hood. The ballot includes the final wording on proposed constitutional amendments, Initiative 42 and Alternative 42A, and their explanations — after much debate and litigation over the wording and explanations. The ballot also includes the Legislative Budget Office’s “fiscal note,” or estimate of how much it would cost if the court ordered full funding of the state’s adequate education formula. It also includes the wording of the proposed amendments. “I thought it was important for Mississippi voters to read what they were voting on in their constitution,” Hosemann said. Initiative 42, brought by advocates of increased education funding, is an effort to force lawmakers, through the courts, to fully fund the state’s adequate education formula, or whatever amount a judge deems is “adequate” for public education. Initiative 42A, brought by the GOP legislative leadership opposed to the aforementioned Initiative 42, is an attempt to keep discretionary budget power in the hands of the Legislature, and-or to derail passage of Initiative 42. * First, people will “VOTE FOR APPROVAL OF EITHER, OR AGAINST BOTH.” Voters will check either “FOR APPROVAL OF EITHER Initiative Measure No. 42 OR Alternative Measure No. 42 A,” or “AGAINST BOTH Initiative Measure No. 42 AND Alternative Measure No. 42 A.” If someone is for changing the constitution, they would check the first. If someone is against changing the constitution, they would choose the second. * But they’re not done either way. They move on to the next section, and “VOTE FOR ONE,” either for Initiative 42 or for the Alternative 42A. Someone who has voted against changing the constitution can still pick whichever alternative they want, assuming it is changed despite their vote on the first question. * For either initiative to pass, a simple majority must vote “FOR APPROVAL OF EITHER” on the first question. Then, presuming that majority is reached, for either to pass it must receive a majority that is at least 40 percent of the total number of people casting ballots statewide. Undoubtedly, the ballot will cause confusion to voters. Read the ballot before going to the polls and be educated on both sides of the issue. 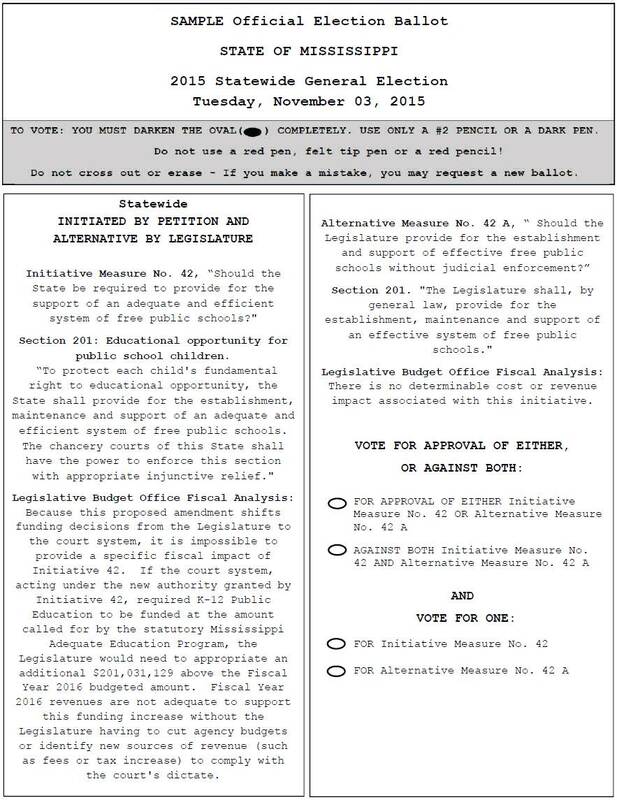 This entry was posted in Public Education, Statewide Ballot Measure and tagged 2015 Election, Clarion-Ledger, Delbert Hosemann, Geoff Pender, Initiative 42, Initiative 42A, Phil Bryant, Public Education, state constitutional amendment. Bookmark the permalink.